KUALA LUMPUR, MALAYSIA — The last thing I Googled before leaving was, “how to survive a riot.” With the help of Bersih 3 (the Bersih riot last year), this branded protest is notoriously known to leave you weeping in public for the whole world to see, and/or rolling about on the ground as the authorities pin you down with tear gas and water cannons. To avoid internationally embarrassing myself, I was well prepared for such a thing to happen. Along with my usual gear, I had added goggles, a few masks, saline solution, a poncho, water rations, long sleeves, gloves, a map of the locale, and a radio to communicate with my assistant. I started the pilgrimage near Bangsar, where the bus had dropped us off. It didn’t take long to find yellow shirts (the brand color of the Bersih riots) scattered throughout the outskirts of the city center, starting out in little groups of tens, rapidly growing into hordes of thousands of supporters. And so I followed this flock heading towards the Merdeka Square. The supporters took over the roads, chanting and singing as they crept closer. The mood however was not what you would expect from a huge mob waving protest signages — the people were not angry protestors, but calm level-headed citizens gathering in support against corruption. You might even call it festive. Once we had arrived at Merdeka Square it became clear that the riot as you might call it, was not so much a riot but a festival. 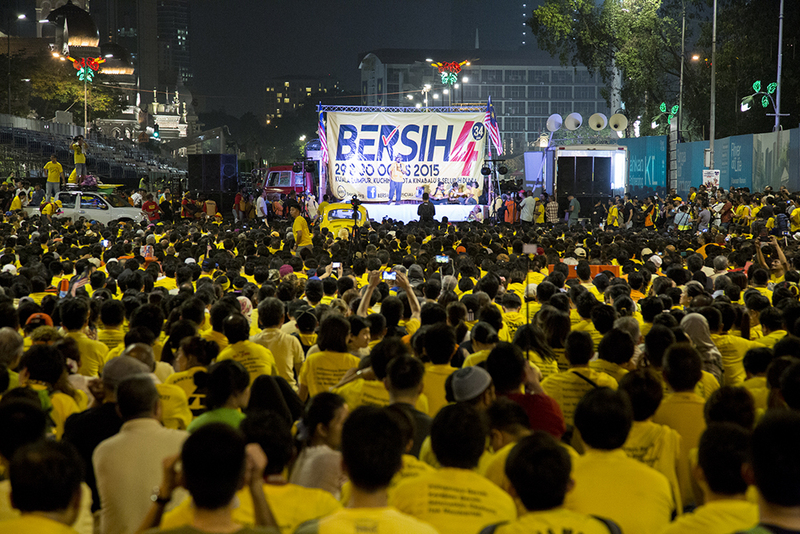 Bersih 4.0 has a few main goals: 1) free and fair elections, 2) the right to demonstrate, 3) strengthening of the parliamentary demoncracy system, 4) saving the economy, and 5) the resignation of Malaysian Prime Minister Najib Razak. After a few hours in the midst of all this I soon realized that this was not a riot for the cleansing Malaysia, but a celebration of that possibility. The makeshift stage was the focal point from where the main idealist spoke to the supporters who sat obediently and intently listened, ever so often breaking out into chanting “BERSIH, BERSIH, BERSIH.” The background flourished with a sea of yellow, horns echoed and drums reverberated in the the distance. Towards the evening of the first day, performers such as stilt-walkers and dancers came to entertain the crowds which kept their spirits up for the long day ahead. With such a gathering of people over the span of 36 hours, one would expect there to be a great deal of litter and trash. Directly translated, Bersih means “clean,” and clearly the people wanted to embody this ideal right to the physical representation of clean. Bersih activists armed with trash bags — not molotovs — swept the streets of litter constantly, gathering them at “sorting stations” under the train tracks to filter out the recyclables. As it turned out, there was no need for pandemic gear. This is how you have a riot: make a festival out of it.